One of the main attractions of Copenhagen is the water. We are a big city, with the sea running through the city center that is clean enough to swim in. If you go to Copenhagen you HAVE to see it from the waterside. Yes, you can do the channel tours and get all the info on Copenhagen history with every other tourist in the city. You can go a bit more “private tour” and rent a GoBoat and see for yourself. Or you can do the new HOT thing and rent a Hot tub to sail around the channels. You read that right. 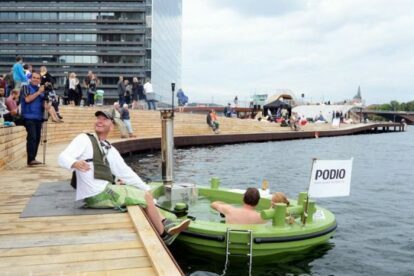 A floating spa boat, with 40℃ water in the cold habor water. The hot tubs can seat up to 5 people and in the rent you get your own skipper, a speaker to play music while on board and a chance to see Copenhagen from its most appealing side. You need to book in advance through their website – and if the hot tub is unavailable, they have saunas with a view of Copenhagen city and the waterfront, which is also an experience on its own.